It can be hard to lose a family member or a friend you care a lot about. No matter what stage in life you are in, losing someone can evoke a great deal of sadness and pain. It’s important to know that these emotions and reactions are perfectly normal. 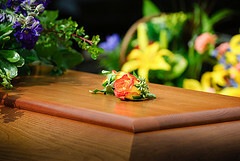 Having spent a great deal of time in funeral homes, I have learned that there is no right or wrong way to grieve the loss of someone significant in your life. However, there are certain things you can do to move toward overcoming these feelings. Grief is natural. Typically, the more important the departed was to you, the more intense the grieving process will be. The ultimate goal is to get past the stages of denial, anger, bargaining, and depression, and move toward acceptance. The first step in achieving acceptance starts with a strong support team to lean on. Whether you are at the funeral home preparing to lay your loved one to rest or it is months later, having a friend other family member to talk to about your feelings can help you feel more comfortable and not alone. No matter if you rely on a friend, counselor, or group to help you through the process, it is vital you go at your own pace. Don’t allow others to tell you how you should be feeling or pressure you to move faster than you want. Often, taking time to take care of yourself mentally and physically will allow you to feel better overall. Once you accept the loss of your loved one, it becomes easier to move on to the next stage of your life.